Amazon Price: $268.00 (as of October 16, 2017 10:55 am - Details). Product prices and availability are accurate as of the date/time indicated and are subject to change. Any price and availability information displayed on the Amazon site at the time of purchase will apply to the purchase of this product. 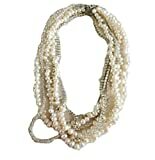 So chic,sophisticated,elegant,stylish bridal necklace! I designed this very romantic necklace with 7-8mm ,unshaped freshwater pearls. I embellished the necklace with Austria Swarovski crystals to give more sparkle to necklace. The lenght is 21'' (54 cm) I used 925 sterling silver closure , For something unique to yourself, mix and match the piece with other items in your jewelry collection. It is beautiful,stylish,elegant wedding accessory! You can wear it for your special evenings,night out,graduations,birthdays…. SHIPPING I ship within the next day of order, after payment is received. I send all orders by Fedex Express Please do not forget to add your phone no for express delivery. Thank You! DELIVERY TIME 3 days DELIVERY ADDRESS Please be sure that the delivery address in your order is the same as your PAYPAL address. RETURN POLICY , please let me know as soon as you receive the item if you are not satisfied with it. I refund if the item is sent back unused and in original condition. Return shipping is on your account. CONTACT Please do not hesitate to contact me for any question. PS All my jewelleries are designed in my smoke free studio and will be sent in bubbled envelop securely so that it arrives to you in good condition.